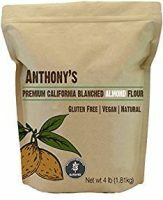 Almost zero carb cookies? Yep. These crispy, crunchy cookies are high in healthy fats, full of protein and fit the macros for an Atkins Fat Fast recipe. Sugar-free Jello adds instant sweetness, texture, flavor and color without adding net carbs. Try versions with sugar-free mousse, custard, pudding or gelatin mixes. Add a little more cream cheese or bake a minute less for softer cookies. Leave out the egg (or not) and add raw dough chunks to your favorite keto ice cream. Add any flavor of sugar-free Jello, low carb dark chocolate chips or cocoa powder, chopped nuts, unsweetened shredded coconut, citrus zest, pureed low carb berries, or flavored extracts to the raw dough. Soften cream cheese and butter. Beat egg together with sweetener and extracts. Whisk baking powder into the almond flour. Add this dry mix slowly to the wet mix a few tablespoons at a time. Blend well using a fork to form a slightly sticky dough. Wrap dough and place into the fridge until firm, 30 minutes minimum, up to 12 hours. Roll dough into one inch balls and place on a prepared baking sheet. Leave about one inch between each cookie. Use a fork, your thumb or the bottom of a glass to flatten the cookies. These do not spread very much while baking. Thin, flat cookies are crispier, bake more quickly, and burn easily. Watch those last few minutes! Bake 6‐8 minutes at 325 F.
Remove from oven and allow to cool 3 minutes before moving to a cooling rack or equiv. Allow cookies to cool completely before serving or they will crumble. Per Serving: 147 Calories; 24g Fat (90.7% calories from fat); 3g Protein; 2g Carbohydrate; 1g Dietary Fiber. Lily’s premium dark chocolate baking chips are your low carb solution for recipes. Lily’s chips are stevia-sweetened, and melt and blend easily. All-natural, non-GMO ingredients. Fair trade and gluten-free. Add 1/2 teaspoon lemon zest to the dough (or use lemon flavored sugar-free Jello). Shape the dough into a log, chill, slice, and bake for 12 minutes. Use raspberry flavored sugar-free Jello and add 1/4 cup pureed raspberries to the dough. Shape the dough into a log. Chill, slice, bake. Substitute 2 tablespoons unsweetened cocoa powder for 2 tablespoons of the almond flour; and add 1/8 teaspoon of espresso powder. Shape the dough into a log. Chill, slice, bake. Add 1 teaspoon ground cinnamon, 2 teaspoons maple extract, and 1/3 cup diced pecans to the dough. Shape into a log. Chill, slice, bake.